_Francesco DiBlasi attended the Detroit Institute of Musical Art, the Julliard School of Music and L'Ecole de Pierre Monteux. He received a Bachelor of Arts Degree from Madonna College, now Madonna University, in Livonia and a Master in Performance from Eastern Michigan University in 1984. Maestro DiBlasi has performed with the Detroit Symphony Orchestra as assistant 1st trumpet for eight years. He also performed with the American Youth Orchestra, Radio City Music Hall, New York City Opera, American Symphony Orchestra and the Metropolitan Opera. He has conducted the Buffalo Philharmonic, Detroit Little Symphony, Ballet Russe de Monte Carlo, Pontiac Symphony, Michigan Opera Company, and Metropolitan Beach Summer Concerts. 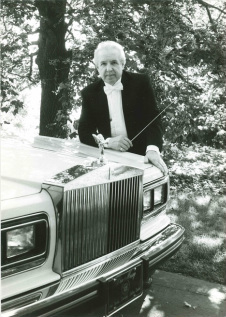 He has also conducted the Grand Rapids Symhony, Philadelphia Orchestra, Scandinavian Symphony, Pittsburgh Symphony, Grosse Pointe Symphony, St. Cecilia Orchestra, Rome Italy; Julliard Opera, Canton Symphony of Ohio, Detroit Women's Symphony. San Diego Symphony, and the Flint Symphony and served on the faculty of Madonna University, Livonia.